A comprehensive test program with the new radar is about to start aimed at having the modernized GLOBUS system operational in 2022. In Vardø, a small fishing village on a little island on Norway’s coast to the Barents Sea, the huge military radar facility forms the skyline. In clear weather, if you look east across the water, you can see the shoreline of Russia’s Fishermen Peninsula, a northern appendix of the Kola Peninsula. Officially, the intelligence service operating the facility has never said the word “Russia” when explaining what the radars are looking for. “The GLOBUS system ensures continued access to important and relevant information of national importance,” are the introduction words by the Norwegian Intelligence Service (NIS) when now making a public statement about the ongoing modernization. Moscow, however, fears the radars could be used to track intercontinental ballistic missiles and monitor activities of the Northern Fleet. It is no secrets that behind the Fishermen Peninsula Russia’s fleet of nuclear powered submarines have their homeports. Including the ballistic missile submarines of the Delta-IV and Borei-class in the closed naval town of Gadzhieyvo, a distance of 148 kilometers from Vardø. 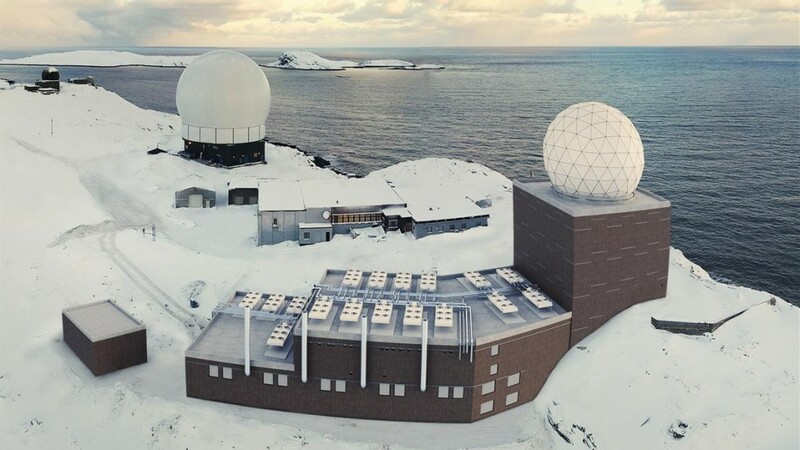 The GLOBUS radar system has been on the hill above Vardø since the 1950s, always as cooperation between Norway and USA. The different radars have numbers. Now, it is the GLOBUS I radar that will be replaced with the GLOBUS III radar. No II has been in operation since 2001. The new radar with the old GLOBUS II in the background. Illustration by NIS. Construction of GLOBUS III started in 2016 and NIS now says the radar itself will commence this fall. Once the radar is installed it will go through a comprehensive test program and be ready for active service in 2022. NIS denies any accusations of the radar system being part of the American missile defense program. “It is not connected to, nor does it transfer information in real time to the US or any other country’s missile defense system – a prerequisite for a functional missile defense system,” the statement reads. NIS says the main mission for GLOBUS is to conduct surveillance on, track, and categorize space objects. Also, the radars collect date for national research and development. Over the last few years, Russia has upgraded its military capacities on the Kola Peninsula substantially with new navy vessels, fighter jets, missiles and other modern weapon systems. Earlier this fall, the Barents Observer published satellite photos showing the massive rearmament, including about 50 new giant reinforced weapons bunkers near Severomorsk and Gadzhiyevo. Last year, other satellite images gave an overview of the nuclear weapons storage sites on the Kola Peninsula.